To properly degrease a chain, put your bike on a work stand and shift into the largest chain ring and the middle of the cassette. 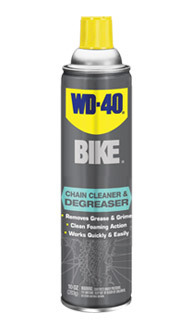 Spray WD-40® BIKE Chain Cleaner & Degreaser on the chain and chain rings. Scrub off deep set grime with a stiff brush. Wet a sponge with water and add some Cleaner & Degreaser to the center. Fold the sponge in half and make a chain sandwich. Back pedal and get the chain to foam. Rinse off the foam and wipe dry.